A 2012 book offers timely advice for Republicans who believe that serving the interests of the wealthiest 1% will maintain their party in power. It’s Confront and Conceal: Obama’s Secret Wars and Surprising use of American Power, by David E. Sanger, the chief Washington correspondent for The New York Times. Afghanistan and Pakistan – How Obama sought to disengage from the former while readying plans to occupy the latter should its growing nuclear arsenal pose a threat to America. Iran – To prevent the Iranians from building nuclear weapons, Obama authorized a malevolent virus to be inserted into that nation’s computer system. Drones and Cyber – American drone attacks have wiped out much of Al Qaeda’s leadership—but increasingly strained U.S. relations with Pakistan. And while America has launched cyber attacks on Iran, it remains vulnerable to similar attacks—especially by China. Arab Spring – America was totally surprised by the popular revolts sweeping the Arab world. And Obama had to balance showing support for the revolutionaries against jeopardizing America’s longtime Arab—and dictatorial—allies. China and North Korea – The United States found itself financially strained to meet its worldwide military commitments. This forced Obama to use a both persuasion and containment against both these potential adversaries. And in its section on the Arab Spring, there is an unintended warning to Republicans and their Right-wing followers. Sanger analyzes why the vast majority of Egyptians felt no solidarity with Hosni Mubarak, the general/dictator who ruled Egypt from 1981 ti 2911. 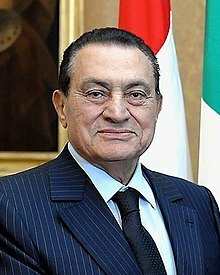 Mubarak came to power after Islamic fundamentalists assassinated President Anwar Sadat during a military review. They believed that Sadat had committed the unpardonable crime of signing a peace treaty with Israel. Fast forward to Mitt Romney, the 2012 Republican Presidential nominee, and his vision for America. Romney did not mention that, in 2007, the richest 1% of the American populace—of which he is a member—owned 34.6% of the country’s total wealth, and the next 19% owned 50.5%. Mubarack was forced to resign, and Quaddaffi—after waging war against his own people—was captured and murdered. If Romney’s—and now Donald Trump’s—vision of “everything for the 1%” is allowed to prevail, they and their ultra-privileged supporters may truly learn the lessons of class warfare.